Use Delta water-based wood sealer on bare wood prior to painting the Delta paints. 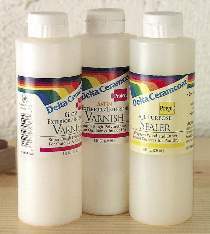 Use our clear water-based varnish as a final protective coat over Delta paint. Clear varnish adds a shine to the paint and extends the life of outdoor or indoor projects and is available in satin or gloss. Both sealer and varnish are non-toxic. 8 ounces.